MIAN sahab had arrived in the plane. 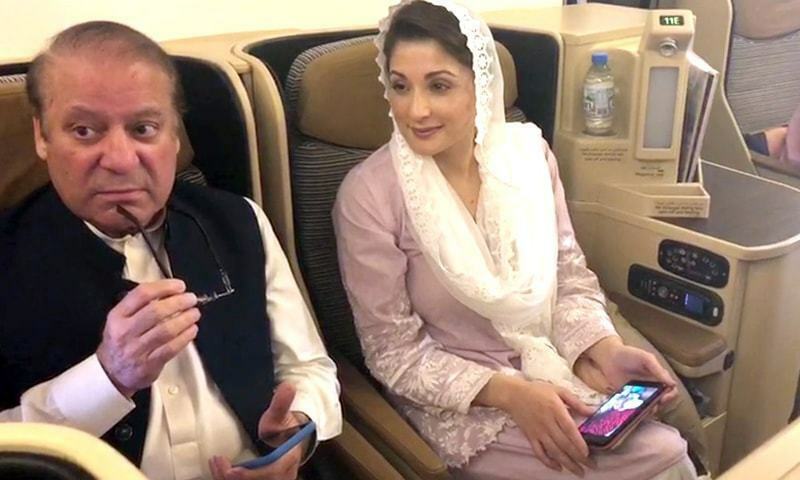 The news spread after the PML-N Khyber Pakhtunkhwa general secretary came back with proof — a picture — that the plane was not going back from Abu Dhabi to Lahore without Nawaz Sharif and Maryam Nawaz. 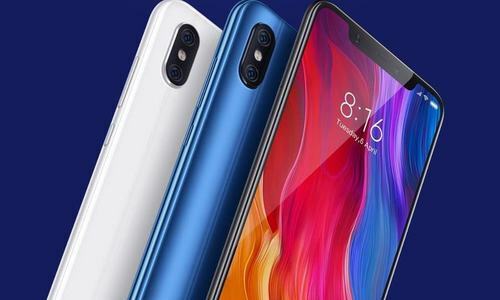 The delayed flight, which was scheduled for 2:15pm but eventually took off at 5:04pm from Abu Dhabi International Airport, was full of restless journalists who were made to board first. Security officials of the United Arab Emirates — dressed in all-white Emirati thobes — made sure that every passenger boarded the plane. Those who were not Lahore-bound were told to go to their gates and clear the area. By the time the last of the passengers (all journalists) boarded the EY 243, there was no one left at Gate 32 apart from the security men in white. Mr Sharif and his daughter were the last passengers to board. Security stayed in the first class area with the Sharifs up until moments before the plane took off. Once the plane was in the air and on its way, the only person Nawaz Sharif called to the front was Khawaja Haris — the lawyer who represented the Sharifs in the Avenfield corruption case. Their meeting lasted a good one hour, as security inside the plane prevented others from going towards first class. There were sporadic chants in support of Mr Sharif and Maryam during the flight but appeared to be more for the cameras than the leaders. 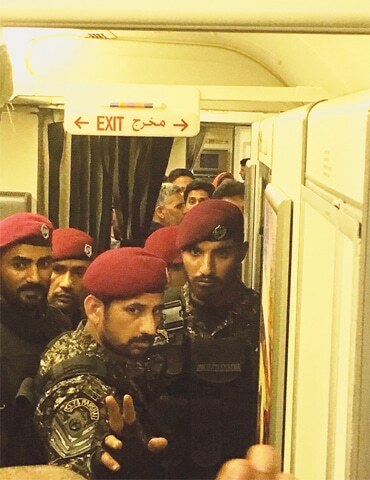 The media, apart from a handful in first class, had no access to Nawaz Sharif and his daughter throughout the flight — or before at the Abu Dhabi airport — but once the plane landed, they started pushing their way through. The moment the wheels hit the ground, those in the first and business class surrounded the Sharifs while two security personnel held back those in economy. The small windows of the plane showed that it was surrounded by male and female security personnel — Rangers and police. Within 15 minutes, the Rangers had entered the plane. They were prepared for the eager journalists and politely but firmly asked that all passengers who wanted to get off the plane should be allowed to do so. Others were asked to wait. Once those passengers had disembarked, PML-N supporters and members and members of the media rushed to the front to get a quote from the Sharifs — possibly their last for a long time. But they were both quiet, Maryam only smiling but her father with an anxious look on his face. Moments before his surrender, gone was the Sharif who was thundering only a few hours ago while talking to the media in Abu Dhabi over the phone. One could say he even looked unsure. The Rangers were on standby but they weren’t rushing him to get up — they wanted the former premier to walk out on his own time. But it wasn’t the PML-N supremo who made the first move — it was Maryam Nawaz who said “let’s go” with finality. 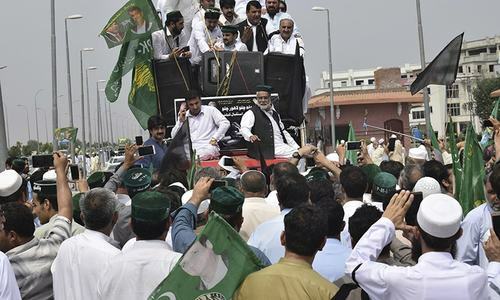 The duo then made their way down the plane, surrounded by Rangers and by the time the media got a glimpse of them, they were encircled by Rangers personnel and some men in plain clothes (some of whom identified themselves as PML-N supporters). There were at least three chains of security personnel around them, two cars where they were standing, and about 15 to 20 steps away, there was a helicopter and one jet with the Punjab government logo. The voice of the helicopter drowned out whatever Nawaz Sharif and Maryam were saying to the officials, but the animated conversation lasted for about 15 to 20 minutes. Shortly after, the two vanished from the view; they had sat inside the car which when moving was surrounded by Rangers who were running alongside it. The car stopped near the small jet ready to take them to Islamabad, where the Rangers again encircled Maryam Nawaz and Mr Sharif. 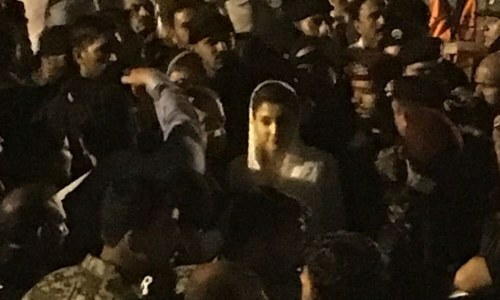 Maryam, after about 10 minutes, could be seen entering the plane. She stopped and waved to the crowd. She called out to someone to get her suitcase, which eventually made its way to the plane. Nawaz Sharif also went inside the same jet, pausing briefly to wave to everyone watching. As the jet started to move, some PML-N workers lamented that Mian sahab had wanted to address the people before his incarceration. But it appeared that he wouldn’t get that chance on Friday. Both convicted father and daughter got what they deserved according to their bad deeds and result of corrupt practices - a very sad day for Sharif's family and their fake dynasty! Finally a convicted thief has reached his fate. One classic mistake after another. Keeping political leaders in prison is the last thing "they" need to give a shot to. This is not Syria or Iraq. The country has a history of fighting back the dictators. We as a nation making heroes out of them who looted misappropriated, and these criminal leaders deserve even more punishment than sympathy. Very accurate title of story. I had been noticing the same. I don’t know sombre because of his child or because he knows the mess getting into. @Akhlaq A. Qyreshi, The ones who realize are the ones who have a conscious, but to answer your question, he doesn't care about what it cost the nation. I have a feeling they will post bail and ride into the sunset, its written all over Mariam Nawaz's face. MAK... courage and grace of a leader! She has been well fed and watered all her life. She has never known what hardship is. Her bank accounts are full of tax payers money with which she travels first class. Perhaps after completing seven years of rigorous imprisonment that artificial smile shall disappear, along with so called courage and grace. We still have a flawed system, their faces look at ease and that must to due to the securities promised and a lavish jail set up confirmed for them! Victim card at its best! @Akhlaq A. Qyreshi he remains clueless! Father and daughter are writing the history book and showing the nation how to stand first time in 70 years.against those who always want to have every control. Money for the dams should be taken from all the corrupt politicians. The states don’t run on charity. States have power to take back the stolen money. States should at least sell their properties in Pakistan. Generally, thieves do not voluntarily give up their freedom it’s taken away from them. You can not expect or demand freedom to loot and plunder public money freely as this so called politician did and allowed his cronies to do. A proud moment for Pakistan. The country has gone through the full trial process and put behind bars a powerful person for corruption. Convicted based on media trial,very unfortunate.Making way for certain politician to succeed will be remembered as most rigged elections in history of Pakistan.Same way Bhutto was treated. He was winner of elections ,but convicted and hanged. @MAK this lady thinks she is Benazir Bhutto and tries to act like her. But unfortunately she is no where near the great Benazir. She pretends to be happy with the decision... Fake and artificial smile can sometimes look batter than the real. @Najum Really dude. This is not about sending politicians behind bars. This is about a thief sent to jail. You have to differentiate between the 2. The rise and fall of Sharif family. Mian Sahib and his daughter show remorse.The government should spare no effort to get to the bottom of how house of Sharif amassed such wealth in such short time and beyond their means .The government should try to confiscate ill gotten wealth and return it to rightful Pakistani people. Make an example out of them. Then pursue others Zardaris , Darrs, Dr. Hussain the list goes on not to mention there are others in Sharif clan that need to be investigated. Where is Hassan and Hussain bring them to justice in front of Pakistani courts. @Najum This mentality is the reason why they are so powerful and we are nothing in comparison to them.. Politicians or Generals our top priority is now to get the stolen money back.. they have screwed the economy for their own benefits and that of their masters. First catch the corrupt and then the dictators. A strong clean civilian government can catch Generals not a corrupt one. It seems Maryam is still living in a fool's paradise. After a few days in jail, reality will hit her soon just like her father who knows well the future of loss of reputation. The law for punishment is different for rich and poor. Nawaz and his daughter go to jail or holidays? they get one servant, TV, air-condition, newspaper and TV, and a poor person has to work hard all day and serve these guys. Shame on our justice system. It is a shame that crooks and robbers are giv en so much space in papers. Nawaz and Maryam are crooks they have robbed the nation blind. Put the handcuffs on them and make them run to the jail. Mistreating Ms. Nawaz could backfire big time being a female she would have sympathies of public. Tread carefully. Criminals who have massacred millions in literal and financial terms, should not be glorified. Here in this part of the world every one who cares for the people is disloged on one pretext or other. His govt has achieved many success despite creating choas by the forces of evil in the last five years. Major u dont need any supper hero lense just imagine lpadshedding crises, law and order and prices of comidity of basic use in 2012 and 2013 to jul 2018. U will find the difference. Empty slogen are eassy and we are witnessing these since long by various forces used for this purpose. @Najum prisons are made for criminals whoever they may be. The idea is to transform the individual and give him to reflect on his actions and deeds. But hardened criminals without conscience are very hard to reform because they commit crimes knowingly and being aware of the consequences but consider the same to be well worth the price if caught. Be truthful. 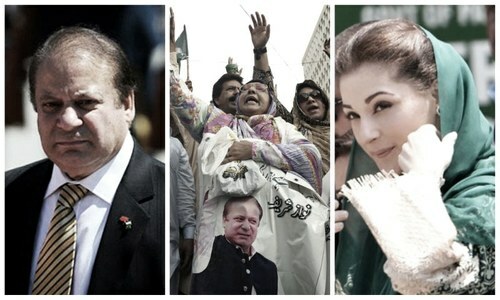 What Mr. Nawaz and Ms. Maryam did is nothing less than bravery. Both could have stayed back in London. Both are changed politicians now. They will be successful. @Najum ... They earned every year of what they got. Corrupt governors in America get longer sentences than 10 years. If you think the Sharifs are Pakistani royalty say so. If I repeatedly lied to the Supreme Court and forged documents presented to the Supreme Court they would not waste any time in sending me to prison. @MAK It is not courage, but pure greed and ambition. She was smiling because she has high hopes of garnering sympathy votes and support and has ambitions to rule the country for a long time. On the other hand, Nawaz Sharif is scared and worried as he has grown old and wanted to leave politics but under pressure from Maryam, he had to come back. A case of beloved daughter asking old father to make sacrifices for her future. Most criminals tend to smile when they have done wrong. @MAK Please do not confuse courage and grace with necessity - they came back because they had no choice and it is for its own benefit not your or mine or the people, this is thier only hope to hang onto power and thier assets. @rashid Well said - some people need to wake up. Fake smiles after plundering public money and 30 yr rule. What is the lesson for our kids and nation as a whole??? Body language was clear. Mariam was full of excitement. She is full of energy. She means business. May be another star is in the making. It is still not clear that how long she can maintain this energy. She has refused preferential treatment that she was entitle. Will hard ship of jail have any affect on her. That is yet to be seen. One thing is sure political dynasty is changing hand/generation. Let's hope it is for betterment of country. Well narrated article.. Maryam showed a great courage and control on her nerves as compare to his father who had been in politics field long ago. Lets see what next is going to come on this way..
What a disgrace they brought to the nation.SHAME. They Got what they deserve, Adiyala Jail !!!! @UmmeAimen Hussain Benazir didn’t return and waited till Musharraf granted her amnesty for the corruption charges against her. Avoid Pakistan for 8 years to avoid 5 years of Prison. I don’t support PML-N but even I realise that these 2 could have easily stayed in London, or gone elsewhere but decided to return and are the first ones to do in Pakistan’s history. @rashid rigorous imprisonment in Sehala Guest house, ????? They Just got vacation home labeled as a sub jail for them. It's a joke. Our correctional system is a joke. Until now the government is spending lavishly on shareefs, and haven't recovered a rupee from them and the shareefs have lost nothing, the govt is at a loss and will remain at loss, because this type of exercise is just for to show that there is some kind of law, then what to lament. @Najum : Yes, ND and MN are courageous and brave. Such people certainly meet some obstacles and few setbacks, but ultimately they will achieve their prime goal. It is natural that brave people do not lose hope and they know that task ahead is not easy -- the path they have chosen has many bumps and ditches. I think father knows what is waiting for him whereas the daughter has no clue what is going to happen her in next few hours. If the accountability process has started then there are lot of big fish to be caught including the remaining 400 odds on the Panama list. Otherwise it will remain a vendetta. This proves NS & Maryam did not came with an intent to defy or create law and order situation.They came to give themselves up to law and what the interim government did was pure intimidation of PMLN workers and leaders. End of Mr. Nawaz's reign of power is a lesson to others. If he would have devoted his time and energy to solve peoples problems, he would have been respected for his contributions to well being of the country and its people. Unfortunately, for many getting in power than forgetting those who put them in power is becoming a norm in great country of Pakistan. I respect only those members of parliament who pull up their sleeves and get busy solving peoples problem. Not for those who get busy building their castle like houses and roam around Dubai and London. while people in the nation suffer without clean water, electricity, lack of hospitals and lack of schools. where is the money for Business class coming from? @Awaz To the contrary, the courts are writing history that First time in 70 years, the corrupts are being disposed of via the courts rather than the undesirable methods i.e the military. Every time the military has intervened, its because the these corrupt politicians have created situations where the very existence of the state has been at risk Just look at the last 10 years, N-league has been harrasing PPP over the judges issue, zardari corruption asking him to write a letter to swiss banks, they has the PP Prime minister disqualified, etc In summary a whole decade has gone where the politicians have nothing but fight each other rather than debate matters that affect the general public in parliament. NS has spend more time going abroad on personal matters than attending Parliament..
His wife is treated abroad while others die due to lack of healthcare on his watch. It will be punishment enough for Mariam Safdar that her iPhone is taken away and she has not access to Twitter and FB..